I told her she could eventually color the comic. She was so excited when I finally let her. Good thing I recorded the whole thing with cam. Update From The Future™: That facecam timelapse where Lily colored this comic is up! Apparently, since the last time I made a modpack, Forge for Minecraft has become a lot better at sorting the different mod’s items around. It’s a much easier process, and because Forge takes a lot more of the dirty work, I don’t have to spoil everything for myself with looking through the item lists! Season 5’s modpack is pretty much ready to go, now I just gotta find a time to record. Y’ever sun bathe? Today was the first time for me, after some coaxing from Lily (another little girl had shown her how to do it), and I don’t know, man. “Soaking up some rays” feels surprisingly good after a swim, in a really energizing way. But I don’t remember the sun feeling that hot when I was little. I felt like I do when I’m too close to a camp fire. Should we be worried about how hot the sun feels, lately? Anyway, I am now .004 shades less transparently pale. 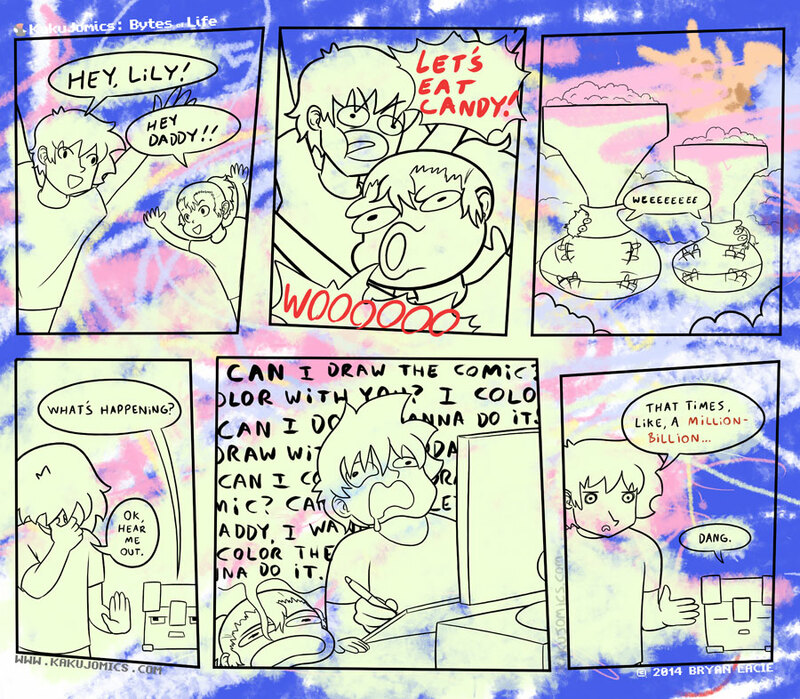 Great Comic as Always Lily & Kakujo! The ozone layer has melted and we’re all slowly cooking, like delicious bacon. But really, her comic page coloring is adorable.